Will you be THE one in a million? You've been shooting. And we've been tracking. 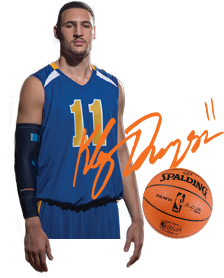 Be the player to SHOOT the 1,000,000th shot WITH YOUR SHOTTRACKER DEVICE and you'll win a Golden State Warriors Jersey signed by NBA Champion Klay Thompson and a ball from Spalding. Pretty cool. And here's where it gets even better. There will be some flash contests along the way so keep an eye on your Homecourt and be sure to follow us on social media. Ready? LET'S GET AT IT. And of course, there are a few rules:Winning shot must be validated by a ShotTracker device. Winner will need to sign a release to receive his/her prize. If the winner is under 13 then a parent or guardian will need to do so for him/her. Promotion is at the discretion of ShotTracker and can be amended at any time.